On April 22, Reuters reported that the Congolese government is accusing Rwandan troops of crossing into the Democratic Republic of the Congo and wounding a local soldier. Congo spokesman Lambert Mende said, “Congolese troops fired warning shots at Rwandan troops who entered Rutshuru territory in Congo’s eastern province of North Kivu,” and that Rwandan troops responded by firing and wounding a Congolese soldier. North Kivu Gov. Julien Paluku told Vice News that the Rwandan troops had crossed the border and headed into the Virunga National Park, an oil rich world heritage site protected by park rangers and the Congolese army. Paluku speculated that the Rwandan troops might have intended to distract attention from infiltration by a new incarnation of the Rwandan- and Ugandan-backed militia most recently known as M23. The Voice of America reported that armed men in Ugandan uniforms have also crossed the Ugandan border into DR Congo. In themselves, these news reports seem low on the scale of violence in the world today. However, they rise to the top if understood as a continuation of Rwanda and Uganda’s cross border wars of aggression that have left millions of my countrymen dead over nearly 20 years. In 1996, Rwandan and Ugandan troops invaded the Democratic Republic of the Congo, starting the First Congo War (1996-1997), then the Second Congo War (1998-2003) and then the ongoing “Congo conflict” waged by proxy militias supported and commanded by Rwanda and Uganda. The International Rescue Committee called it “the most lethal conflict since World War II” after concluding, in an epidemiological survey, that it had cost 5.4 million lives between August 1998 and April 2007 alone. The economy and infrastructure of the Democratic Republic of the Congo has been destroyed, and many of the dead have perished in refugee camps. Many of them have been children under the age of 5. Rwanda and Uganda’s cross border wars of aggression have left millions of my countrymen dead over nearly 20 years. Readers unfamiliar with DR Congo and the region might ask, “Pretext for what?” Those who understand the region know that the pursuit of hostile militias is a pretext for plundering the abundant natural resources of DR Congo. There is abundant evidence of this in 18 years of the U.N. Group of Experts Reports on the Democratic Republic of the Congo, all of which can be read or downloaded on the U.N. website. 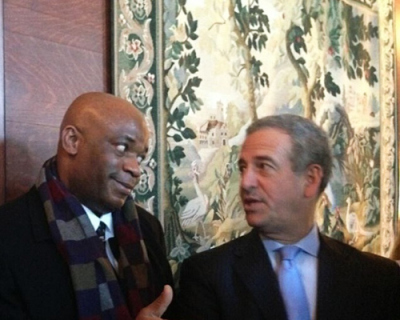 When I met with Russ Feingold, former U.S. Envoy to the African Great Lakes Region, he told me that Rwanda’s pretext for sending troops into the Democratic Republic of the Congo – hunting down the FDLR militia – is no longer credible or acceptable. The pursuit of hostile militias is a pretext for plundering the abundant natural resources of DR Congo. In accordance with the Obama law, the U.S. should withhold aid to Rwanda and Uganda and impose sanctions on its presidents and other government and military officials, whose culpability for cross border wars of aggression and illegal resource extraction in the Democratic Republic of the Congo have long since been documented. President Obama is nearing the end of his term in office. His 2006 Obama Congo Relief, Security, and Democracy Promotion Act is almost 10 years old, but it has never been implemented, even though it was passed by unanimous consent in both the Senate and House. It should be implemented now, before many more innocent Congolese lives are lost. Eric Kamba is a Congolese American social worker with the Boston-based Congolese Development Corp. He can be reached at [email protected].